This revolutionary alpha hydroxy acid (citric, glycolic and lactic acids) peel reduces fine lines and wrinkles improving overall skin tone, texture and clarity by stimulating cellular turnover through epidermal exfoliation and renewal without any downtime, peeling or redness afterwards; just glowing, healthy skin. is perfect for you! This celebrity-loved treatment is a favourite before big events and is often known as the ‘Hollywood or lunchtime peel’ due to there being no skin prep needed and no downtime required afterwards, simply a glowing rejuvenated complexion! 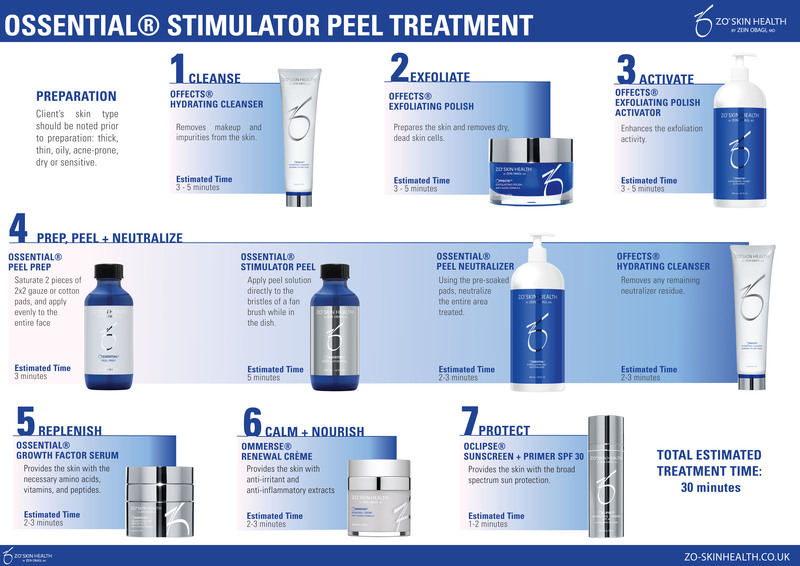 ZO® OSSENTIAL® STIMULATOR PEEL uses a combination of three exfoliating ingredients to slough away dead skin cells and any superficial blemishes to reveal fresh, clearer skin underneath. It also stimulates cell turnover for continued improvement to the skin. Most of our clients will see a dramatic improvement in their skin after just one peel. However, we recommend a course of 4 one week apart then once per month for maximum results.